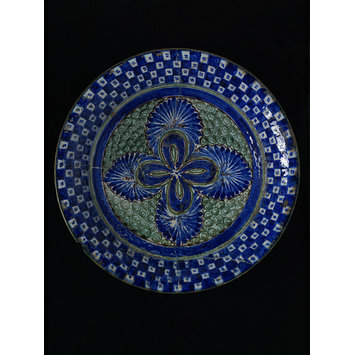 A variety of boldly decorated ceramics were made in Central Asia in the 19th century. These included brightly coloured slipwares from Bukhara, Samarkand and Rishtan, as well as white-glazed wares, painted in blue and purple, from Kokand. There is no evidence that these wares were made in continuation of an earlier local tradition. They are frequently found in Western collections, and it is likely that the West was an important market. So, although this appears to be traditional "peasant" pottery made by and for local communities, it may actually be a conscious attempt to capitalise on the desire for such traditional goods among modern consumers. 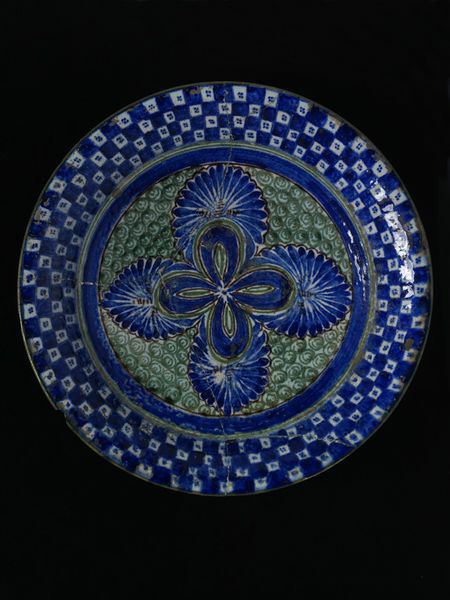 Large earthenware dish with painted decoration in blue and green on a white slip ground, with radiating four-lobed motifs in the centre and a checked pattern on the rim.